Anyone who has ever been to a Hanukkah dinner arrives expecting the gold standard of traditional, delicious Jewish foods: kugel, challah, chicken schnitzel and various delightful things fried in oil, including sufganiyot, the soft, jelly-filled doughnuts, and latkes. 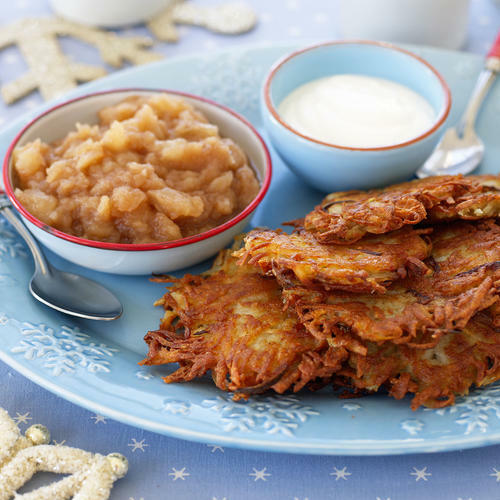 While the crispy potato pancakes are typically served with a side of applesauce or sour cream, they also make a stellar vehicle to showcase more surprising flavors. For Yehuda Sichel, executive chef of Philadelphia’s , this refresh is integral to his cooking. Part of the the CookNSolo restaurant empire that also includes Zahav and Federal Donuts, the sleek little in Center City is known for infusing fresh flavors into classic Jewish staples—there’s borscht tartare served with a dollop of smoked trout roe, scooped up with ranch potato chips, Hungarian duck with schmaltz rice and pretzel steamed buns baked in house, and, in a twist on the soda fountain favorite, a bacon and egg cream with maple custard. “The common denominator with all of them,” says Sichel, who was raised eating the traditional version of these foods, “is how I wish they tasted. How they could taste.” Take the latke, for example. “Even when they’re burnt, or not seasoned enough, or not crispy, or super-greasy. 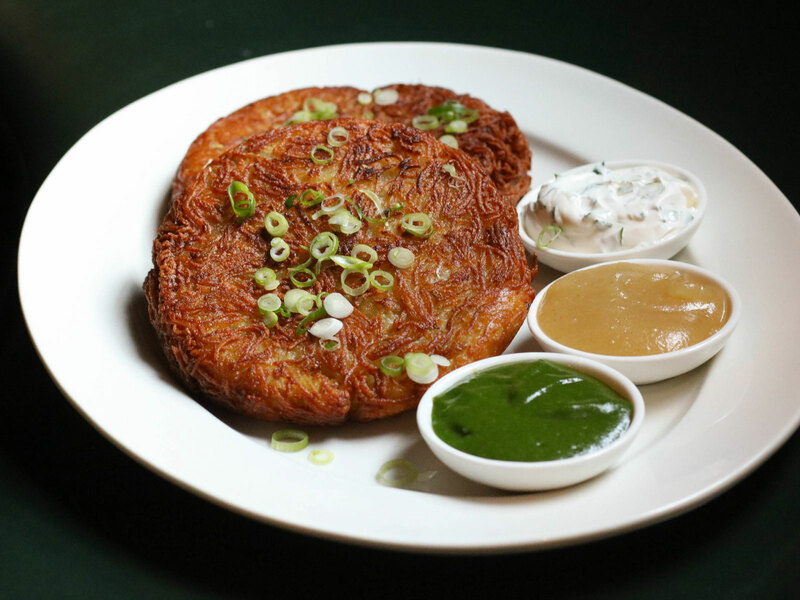 They’re still really good.” But the chef aimed to perfect the recipe—one that yielded crispy, creamy on the inside, well-seasoned latkes. 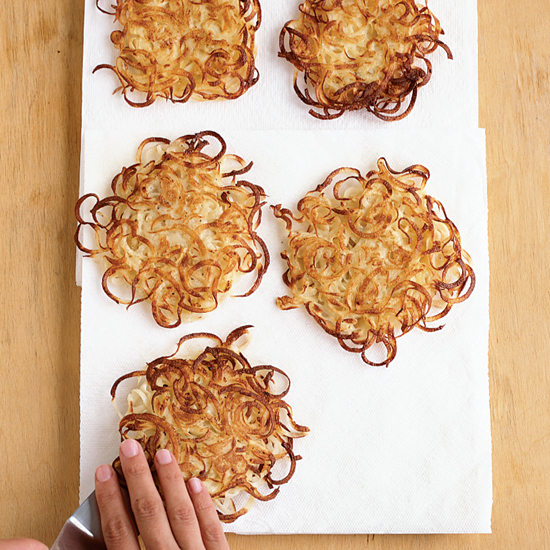 To avoid a crumbling potato pancake, baby them a little and don’t rush the flip. Prep the the ingredients first. Don’t squeeze out the water. Get creative with your toppings. While Sichel doesn’t deviate from his time-tested recipe, the chef mixes it up with fresh toppings, including sour cream and caviar or scrambled eggs and cheddar cheese and black truffle. And while Sichel says they’ve used the pancakes as a vehicle for “more luxurious things” like salmon tartare and beef tartare, this year for the restaurant’s annual Hanukkah dinner, they’ll come with elevated versions of the classic dipping sauces: house-made sour cream, applesauce spiced with the Yemen blend by spicemaster Lior Sercarz, and green tomato ketchup. “We were an applesauce family,” says Sichel. “There’s always the applesauce versus sour cream debate, but as an American, you can’t forget about ketchup.” Abe Fisher’s take will be made with green tomatoes, puréed parsley and watercress to give it an herbaceous flavor and brighten the color, vinegar, garlic powder, onions and a little high fructose corn syrup, “to make it traditional Heinz flavored,” he jokes. Узнать как http://www.chemtest.com.ua у нашего менеджера.